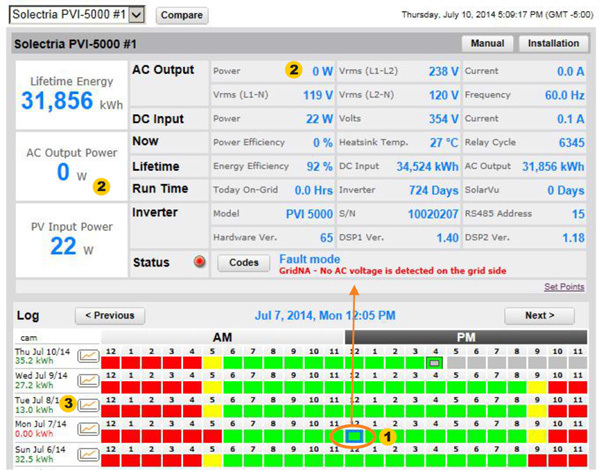 Diagnose hard to find Intermittent problems like a periodic inverter shutdown from a voltage sag using the 30 day inverter log. Reconstruct all conditions every 10 minutes to determine what caused the problem. Engage remotely located external experts to assist in suggesting corrective action using the online log. Restore operation faster to minimize generation revenue loss. Compare output from 2 inverters under identical conditions. Detect performance issues like dirty panels, shading or faulty equipment.